This article is to try and inform therapists about Dissociative Identity Disorder (DID) by sharing somebody's lived experience. Her words have something for us all to learn from. The lady who has contributed her story is called Michaela and I have come to know her through her Twitter presence. I was alerted to the fact that she was about to start counselling at a local agency but shortly after her initial appointment she found out that the agency had been struck off by the BACP for serious misconduct. This brave lady has gone onto petition our local MP to push for the statutory regulation of counselling and psychotherapy. Her online petition can be found here. I have also asked for some input from Carolyn Spring, a director of the organisation Positive Outcomes for Dissociative Survivors (PODS) and she has kindly given me permission to use the extracts from one of her articles aimed at therapists which I have included at the bottom of this piece along with details of their wonderful training courses which are held all over the country. I was diagnosed with DID when I was 22 years old after a stay in a psychiatric hospital. Even before I received my diagnosis I always knew from a young age that I was different from other children. From as early as I started school I have always experienced periods of the day that I couldn’t remember. At school I was often told off for lying. The fact was I wasn’t lying. I couldn’t remember learning parts of the curriculum and therefore couldn’t complete the work I was asked to do. I use to think people were trying to trick me so I learnt not to be trusting of others. One thing that made it harder to understand was when I asked my parents what was wrong they just said I was a forgetful child and it was nothing to worry about. It wasn’t until I was a young adult when the time loss started to become a problem. I started to engage in self-harming behavior, well that was at least what I was told. I just accepted this was the truth, after all the cuts on my arms and the admissions to hospital were the proof. I didn’t question what I was accused of because there was now physical evidence of what I was being told I had done. At 18 a psychiatrist saw me for the first time because of an overdose I had took. I didn’t remember taking the medication but I was so scared of being accused of lying, I admitted I had done it but said I didn’t know why. The reason I have my disorder is because I suffered severe abuse at the hands of both my parents, most of my relatives and then friends of the family. I cannot remember how old I was when my abuse started but I always remember it being a part of my life. I just accepted this to be normal. I remember at one point, I am not sure how old I was, I wished I was hiding in the garden or the woods and therefore wasn’t being abused. Although I do remember a lot of my abuse I think I somehow imagined so much that I was hiding that I created my alternative personalities. The time loss I experienced and still do was when the other personalities took over when things got too much for me. In a way it meant the abuse was happening to them and not me. It meant that during my abuse when things got too much for me another personality would come out and I would sort of take a rest from it all. It meant that the abuse was shared, going to school was shared, but most importantly the pain fear and trauma was shared. We managed to work together to protect ourselves as much as we could and live as normal a life as possible. I guess looking back the personalities protected me. They worked together as a team to protect each other as well. They would comfort each other in an internal world that I was kind of separate from. This meant when I was struggling and not coping they would come out to protect me. I would lose the time and my body would heal while the other personalities were out. We kind of self-nurtured each other through a horrific childhood. I would say that although my life is different to many I wouldn’t really want to live a conventional life as to me it would be alien. To me there isn’t really anything wrong with living the way I do and sharing my mind body and time with the other personalities and in a way I would rather this. Between us we achieve more than what I feel I could achieve on my own. On the down side even though I am no longer being abused I feel I have to worry about keeping safe to a greater extent. We now finally have the freedom to do as we please with our life. It is still a life that is shaped by our abuse and this does shape how we all live our life. Of course to the outside world I am seen as an adult. Every day people do not know there are a host of personalities who are of different ages and therefore see the world from a child like perspective. While many people are careful with how they interact with a child, many are not as considerate when it comes to interacting with what they think is an adult. The body is that of an adult but even as myself I feel quite young for my age. There have been times in my life where either the younger personalities or myself have been re-traumatised because there are times when the younger personalities or I do not feel able to say no to certain activities. Also where we have been abused all our lives some don’t know they have the right to protect themselves etc. It is a case of the older personalities kind of play parent to the younger personalities but also to me as well at times. We have all been safe from abuse for 7 years now. This is the longest period of time we have been safe and I am very proud of our achievement. Even though we know we are safe we live with the daily fear of being scared that one day we will be found and took back to our family. I think many mental health professionals do not understand DID. Some may not have come across it before and therefore do not know how to work with it. Some are fearful of the disorder and some are just so ignorant they refuse to believe that it exists.. This in a way means the most hurt and vulnerable members of our society are not offered help and support and this, without looking at their daily struggles, is sobering. Sometimes when mental health professions do know about DID they refuse to talk to the petals and this again hurts me. I feel they have already led an invisible life keeping me safe, that they too were abused and yet they are turned away by the people who are willing to help me. What these professionals don’t understand is that they could actually learn so much about me if they was just willing to listen to the petals. I often really struggle to ask for help when I am struggling. The other personalities will give an honest account on how things are. They will tell people when I am feeling low etc and most of the time have a better understanding on what is going on than I do. I feel that some people get so wrapped up in what my disorder is suppose to mean that they miss what is most important and that is the hurt person behind the label. Instead of treating the disorder they need to treat the person who is distressed. Before doubting my disorder or presenting symptoms people need to acknowledge that their actions towards me have consequences and those consequences have reactions that will shape my life and perceptions of it. I may have the other personalities but the most helpful thing anyone can do is acknowledge them and treat them age appropriately. They are simply different aspects of me at different ages and stages of my life. If they are ignored than so am I and it is ignorance that allowed my abuse to go on for so long. It was the fear of not understanding my disorder that left me without support for so long. It was the not knowing what to do that left me at the mercy of my parents and it was the not accepting that meant none of us spoke up. To listen to all of us is to accept all of us and to accept all of us allows us to move on knowing that we are not some unusual condition but a person who just has many aspects to them. My disorder is only what a person makes it and if someone chooses to make it a condition they cant understand then that is what it will be. If they choose to be accepting and open with no preconceptions then they will realize that I am no different to support than any one else with a trauma related past. All we want is practical and emotional support to rebuild our lives after a history of severe abuse. I do not want to live my life struggling to get people to understand me. I simple want people to accept me for who I am and realise that this is fluid and can change. Everyone has different aspects to their personality, mine are just more separate. I’m wary of the ‘expert’ label, because it evokes power and authority, and for those of us who have suffered abuse at the hands of people with ‘power and authority,’ it’s a shaky way to start. I prefer the label ‘human being.’ I value the fact that people are trained and knowledgeable, that therapy is a ‘profession’ for ‘professionals’ and that the training is designed to safeguard the vulnerable. But treating dissociative identity disorder is not like chasing bacteria out of the bloodstream. It’s about a human being coming alongside another human being and giving them the courage to face the trauma and the abuse that has threatened to overwhelm them. In that setting, I don’t want some bespectacled expert who can quote chapter and verse. I want someone who at core is a thoroughly decent human being, who is willing to let me be the expert on me, who is willing to learn about me with me, and not assume that I am like every other dissociative identity disorder client he or she has ever previously known. It is a way of coping with trauma by avoiding it. What that trauma is, what it has meant for me, how I have avoided it, what I need now, the sense I have made of myself and the world – all of that is unique to me and my history. 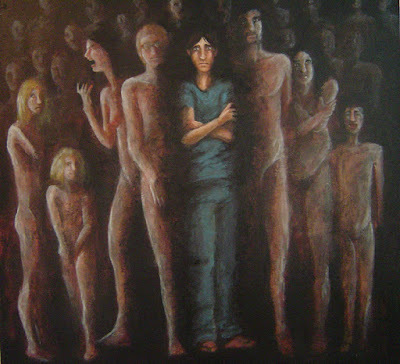 Perhaps some therapists feel a little scared when faced with the prospect of working with people with dissociative identity disorder, as if the label is all there is to me and others like me. But I find that they are scared much less by the prospect of working with me as just a traumatised human being. It’s incredible how intimidating and off-putting a label can be. And having it is no big deal. Of course it’s difficult, of course it’s this overspill of trauma that affects every aspect of our life, of course it’s this roller-coaster ride of disowned and then overwhelming emotions, but it’s just dissociative identity disorder. The therapists who aren’t impressed by my diagnosis, and aren’t scared by it either, but see me as a human being who has experienced suffering and who needs to heal that suffering, seem to be the ones I am most likely to trust and be able to work with. I highly recommend the training that PODS run which I feel is fair to say is amongst the highest quality CPD available for therapists. The link to their training events is here. I also recommend you consider becoming a Friend of PODS which is only £20 per year for which you will receive a minimum of three copies of their magazine Multiple Parts per year. This is full of stories and information useful for both therapists and survivors. *Special thanks to Michaela for generously sharing her story and for all the hard work she does to raise awareness of abuse. A link to Michaela's full and unedited version of this can be found here.